CAR-CRAZED crowds rallied in the Wollongong Novotel lobby to get the exclusive on the Milton MRTeam and a sneaky glimpse at two of its exceptional race cars. The family welded Marchello Racing Team took to the masses to display its high standard of professional V8 racing and its matchless mechanical mastery. The exhibition gave the MRTeam a chance to reveal itself to supporters and a wide range of businesses from across the region. The two cars showcased were both creations of rebuilt beauty by the team members, who are skilled mechanics. Both cars showcased attracted a large amount of the attention at the event. “As our first time in the marketplace, we found it to be an invaluable networking experience in which we have made some great contacts,” said marketing/media manager and daughter, Shannan Marchello. 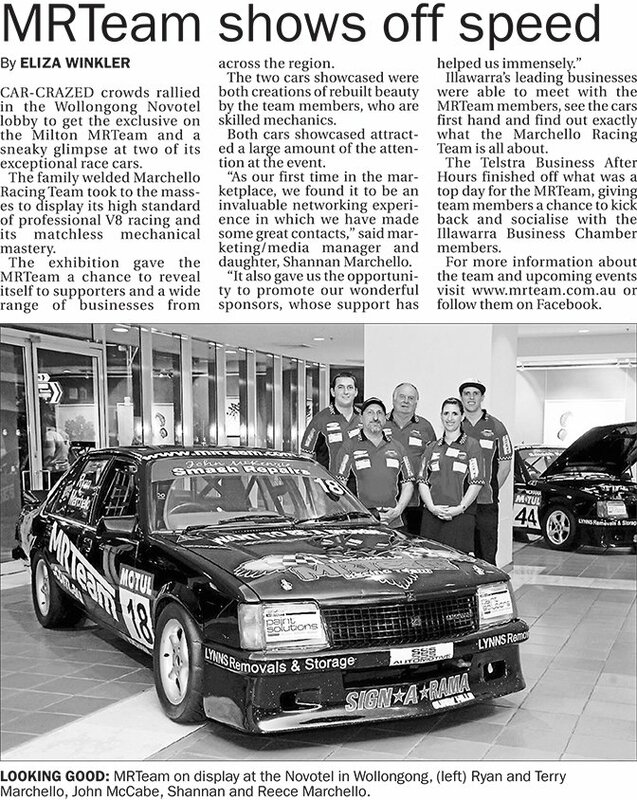 Illawarra’s leading businesses were able to meet with the MRTeam members, see the cars first hand and find out exactly what the Marchello Racing Team is all about. The Telstra Business After Hours finished off what was a top day for the MRTeam, giving team members a chance to kick back and socialise with the Illawarra Business Chamber members. For more information about the team and upcoming events visit www.mrteam.com.au or follow them on Facebook.